The second CD contains four works, all named after women, that used to be more popular. Who knows why they went out of fashion? Draw a hot bath, and while you're soaking in it, soak in the lush melodies, harmonies, and orchestrations of four French masters. You might need to rinse yourself off after it is all over. Dukas's tone poem (the important prefatory Fanfare is included here too) is played by Frémaux and the Monte Carlo Orchestra. The péri is an odd combination of fairy and Norn; the tale told by Dukas's music is of an aging ruler who, having obtained the Flower of Immortality from the péri, is seduced into giving it back. (Perhaps significantly, this was the composer's last major score.) 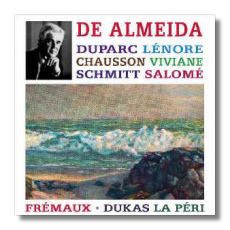 The orchestra responds to the music's tints and colors, and Frémaux balances necessary languor with forward movement. The engineering, transferred from an LP, is superb. The remaining works come from an LP that RCA Victor released in the 1970s, I believe. I remember that it was instant must-have among knowledgeable critics of the era, and it is a mystery why it has not been transferred to CD until now. Henri Duparc is most famous for his songs, of which there are little more than a handful. 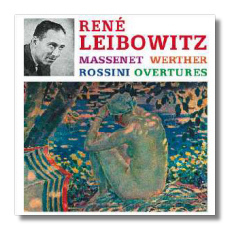 Lénore is his most familiar orchestral work – which isn't saying much, because he was even less prolific in this genre. This 12-minute tone poem, based on a well-known German ballad, describes the sufferings of the eponymous lady, who is carried away on horseback by the ghost of her betrothed. Duparc was a pupil of Franck, and Lénore shows his fingerprints, as well as those of Richard Wagner. (In fact, parts of Lénore hover close to Tristan.) Viviane, an ally of Merlin, is the subject of Ernest Chausson's tone poem. Here, Massenet's influence is added to the heady Franco-Wagnerian brew. And if today's listeners know Florent Schmitt's Tragédie de Salome, it is probably because of Paul Paray's famous recording from 1958 with the Detroit Symphony Orchestra, reissued on CD in 1994. Based not on Oscar Wilde but on a poem by Robert d'Humières, Schmitt's score (which is almost contemporaneous with Richard Strauss's opera) emphasizes the Symbolist and supernatural elements of Salome's tale. Again, late French Romanticism of the richest type is predominant, and there are surprising hints of Stravinsky's Le Sacre du printemps in the culminating "Dance of Fright." Paray's recording is inferior to de Almeida's on two counts. First, the Detroit orchestra sounds weak and tentative at times compared to the New Philharmonia. Second, Paray omits the score's offstage soprano solo; De Almeida includes it, although we are not told the name of the singer. Not just in the Schmitt, but also in the Chausson and the Duparc, de Almeida and the New Philharmonia Orchestra throw caution to the winds, and play the music not just with polish, but also with all the abandon it deserves. It would be wonderful if this ReDiscovery reissue made history repeat itself by exciting the same admiration that the LP did upon its original release. Again, an LP has been used as the source for this reissue, and what was a demonstration-class LP becomes no less impressive in this digital remastering by David Gideon. As with all ReDiscovery releases, this is a CD-R, and the packaging is minimalist, although there are annotations (on the inlay card, not in a booklet). CD-Rs will play in most machines that play CDs, although there are a few holdouts. (My first generation DVD player, for example.) If you encounter any problems, ReDiscovery will make good. These discs are available from the ReDiscovery website (www.rediscovery.us) for $15 each, which includes shipping. These are good people, and they deserve your support. Strike a blow against generic music-making and turn back the hands of time!